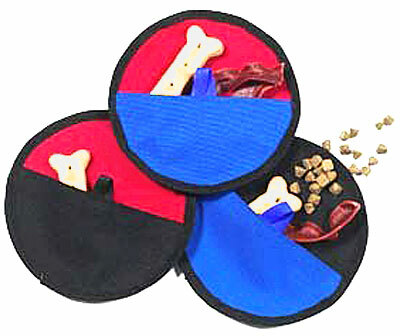 The Toss N Treat is a Frisbee dog toy but also has a pouch which can be filled with tasty treats! The pouch is secured with a Velcro opening. Even dogs that don't normally chase and fetch toys will love this fun treat toy. The webbing-reinforced edges and strong fabric make this toy tear resistant. A hidden piece of safe PVC plastic tubing helps this treat toy fly better and gives buoyancy for water work. This treat toy is great for everyday play and excellent for teaching retrieve, Frisbee games, and "send away" exercises in obedience and agility training. The Toss-N-Treat is 20cm in diameter, light-weight, and very durable. Available in one colour - red with purple.